THIS MEANS WAR is a rom-com so excrescent that my use of the word excrescent contains more intelligence than its entire run-time. It's a confection so plastic and manufactured, so alien to any actual authentic emotion, that its the cinematic equivalent of a children's brightly coloured bouncing ball. The sets and locations are perfectly manicured and designed, as are the three lead characters - all far better actors than this lame story deserves. Reese Witherspoon plays one of those bouncy vapid heroines that she so brilliantly satirized in LEGALLY BLONDE. In the ultimate risible movie set-up, she starts dating two hot guys - Chris Pine (STAR TREK) and Tom Hardy (THE DARK KNIGHT RISES) who just happen to be both best friends and spies. Cue lots of magical dates (who goes to a circus for Christ's sake?! ); awkward Hollywood dancing around the fact that Little Miss Perfect might be banging two guys; and stupidass skits revolving around spy-cams and gadgetry. It is neither edifying nor entertaining - a transparently shameless cash-in. I discard this film - even for McG, this is scraping the bottom of the barrel. 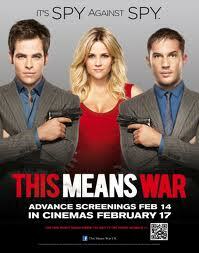 THIS MEANS WAR was released in February 2012 and is available to rent and own.